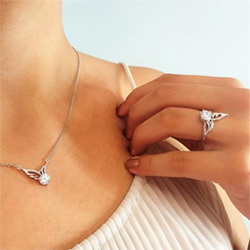 Drawing inspiration from the belief that angels have a perpetual presence in our lives, this exquisite ring made from the highest quality sterling silver features an elegant angel wing, embellished with 12 gleaming cubic zirconia stones. The wing's inner curve gives rest to the magnificent cubic zirconia stone above. Invite serenity into your life and let your Guardian Angel surround you in loving support and encouragement. Feel hopeful and infused with brightness, knowing that a guardian angel is always by your side. Really love the quality and the design of the ring. This ring is so beautiful. The quality is spectacular. The sparkle of the stones are brilliant. Thrilled to have this ring. I’m ordering one for my sister!! Another beautiful ring from Linda’s Angels. I purchased two rings and love them both. Excellent quality, fit is perfect, definitely will order again! ring is beautiful and I really love it. I would recommend this to other people. Very satisfied. I have been looking for a ring that has meaning and this fits the bill perfectly. Beautiful, and so shiny. I love it! I was so excited to receive it. It was as beautigul as i thought it would be. Love it and so happy it came so soon. Received my ring today. My previous engagement ring broke many years ago. Since my husband passed away in March, I thought this would replace it appropriately and complement my wedding band. I am thrilled with it! This ring is absolutely beautiful! Great quality..I am looking forward to purchasing more of your jewelry!! An Angel's Embrace Ring is beautiful........ there is a reason that I especially wanted & love this ring. It makes me feel close to someone(s) who has gone away. This ring is beautiful! I wasn’t sure when I ordered if it would be a good quality or not. It is definitely an excellent quality ring! I love wearing it! Ordered this one in a size 7, perfect fit! The ring is absolutely beautiful. I wish the stone above the wing was slightly higher. The design is very nice. I love the ring. Very beautiful and I have gotten many accomplishments on my ring. I have had so many comments on how beautiful my ring is. When I explain the meaning, people are very touched. I honestly feel like I have my loved one with me when I look at or touch this ring. It is a awesome reminder!! Love, love, love the ring. Beautiful ring & it looked good on her. Getting the earrings to match. This ring "Angel's Embrace" is a good reflection of the faith and guidance you need in a Marriage. One of the songs that the words hold so true to us is, "The Prayer" and this ring is a constant reminder of that. My ring is beautiful. Looking forward to shopping with y'all again. I purchased two of these rings. My best friends mother passed away a year ago and she was really struggling with the loss .Before I gave it to her, I showed it to another friend and she thought it was gorgeous, Girlfriend #2 husband was scheduled for open heart surgery. He never woke up and we attended his funeral. I quickly ordered another ring for her. She absolutely adored her new ring. Both my friends love their rings and wear them all the time. This is my first ring purchase from Linda's Stars and I am absolutely in love with it. So stylish and pretty. I am more than satisfied with the quality and the appearance. Will buy again for sure. I love my rings,1 for myself and 2 for my daughters,I loved them so much I ordered some more for my grandchildren. Hope those are just as good. Love the ring! The design is awesome. I love it !!! It's better than the picture shows. I'm very pleased! Beautiful ring with an elegant design. The angel wings are symbolic to my parents & they are with me always. Very pretty ring to remind me of my son who has passed. I love the fast service. I was not expecting that. The ring is just what I wanted it looks so elegant. It is just as beautiful as it is shown! I will order again from this site. Have ordered before and not been disappointed either time. It looks exactly like the picture. Very happy with it. My wife loves the ring and it fits perfect I thank you. I got it for my Grand daughter for Christmas and was concerned that it would not meet my expectation. I surely did not need to be concerned. The ring far exceeded what I had imagined. It is gorgeous, the size was perfect and the best part -- SHE LOVES IT! Beautiful Christmas gift for my wife to go with the necklace I got for our daughter. Very pretty ring. Very good quality. Love it and would definitely tell others to buy your merchandise. I bought the A PIECE OF MY HEART IS IN HEAVEN bracelet for my sister for Christmas. When she received it, she called me to say, "You made me cry!!". She absolutely loved it!! Thanks for providing such a perfect gift idea!! the ring is beautiful and fits perfect. I love it. Love it! Definitely worth the money. The ring is outstanding, it sparkles; I wish you did have half sizes; it would be a better fit for me. I will be wearing it in memory of my perfect brother that passed away two years ago. It was a gift and they loved it. Going to give to my girlfriend and she is going to love it! It is stunning. I love this ring. It is a reminder of my love for those who are no longer with me. I have smaller hands and I was very happy with the way the ring looked on my hand. The ring is Absolutely Gorgeous! I was really surprised when I got it. I also ordered Earrings! I will know now that I will love them as much as I do the ring. I think anyone that is skeptical about getting the ring, don’ be! They will ❤️ love it as much as I do! I collect angels, and the ring fits in the same category. I am sure I will be ordering more of your jewelry in the future! Have a Wonderful Day and a Very Happy Christmas, but remember what Christmas is all about, it is not purchasing or receiving gifts, it is our Lords Birthday and lets celebrate it as such! Exactly as I expected. I had so many compliments in the short time. I love this ring. Ordering though the mail you never know what the quality will be but I am extremely happy with this ring. My mom, my best friend, passed away 8 months ago from cancer. I saw this ring on Facebook and ordered it in memory of my mom who is now my angel watching over me. Beautiful ring!!!! I am very happy with it!!! I bought it to remember my deceased true love. It’s perfect. I loved this ring the minute I saw it. Was so excited to get it. When it arrived and I put it on I loved it more than when I first saw it in the photo. My husband passed away last year and it's a perfect reminder he is always with me. I will wear it proudly, in regards to my husband who is in Heaven!! Love the ring an hope to buy another in the future. Love my rings. We recently lost our 16 month old granddaughter to pulmonary hypertension. Love this ring. It's beautiful. Love my ring and those I have shown it to loved it too!